This feature can be accessed from the Account>Manage Review Sets page. It provides the ability to create review sets, assign documents and reviewers, dynamically assign and release documents to individual reviewers (25 at a time), and track review progress and status. Please note that only the Account Administrator Users have the ability to create Review Sets. If you can't access or review sets of document and you believe you should have administrative rights to the account, please contact the Account Admin User(s) for your account. Review Sets house Review Batches. Review Batches contain approximately 25 documents. A Review Set can contain any number of Review Batches. Navigate to the Accounts tab. Choose “Manage Review Sets”. Then click the “Create New Set” button. A dialog box will open with the default name of the Review Set as “Review Set mm-dd-yyyy”. You can edit this as needed (e.g. 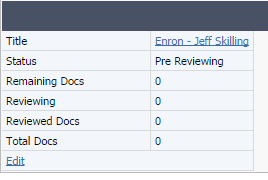 Enron – Jeff Skilling Review Set) or leave the name as is. After you create the Review Set, a dialog box will open giving you the ability to edit the title of the Review Set if it needs to be. If there is more than one Review Set created, the names of all Review Sets will appear in the dropdown menu. A. Navigate to the Browse tab or the Search tab. B. Locate the documents you wish to add to the Review Set. There are different methods to determine which documents you need to add. a. You can locate the documents you wish to add by filtering for the documents on the field you want to review. If you have assigned Custodian/Case Participants to documents in Lexbe at the time up upload, or later through Multi-Doc Edit or in the Document Viewer, you can use the sets of documents filtered by 'Custodian' to create review sets. 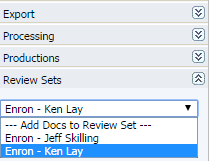 For example, if you wanted to add all documents that have as their custodian Ken Lay. You would filter on the custodian “Ken Lay” and select all of these documents. b. You can search for documents with specific keywords in the Search tab. You can also use your saved searches from previous searches via the Search Quick Links. D. On the left side of the screen, find the section “Review Sets” towards the bottom. F. In the dropdown menu for “Add Docs to Review Set”, select the appropriate Review Set. I. You can also select documents that you just added to a Review Batch and remove them by selecting the option 'Remove Docs from Review Set'. Once you have added the documents to the Review Sets, you must then activate the Review Sets for the document reviewers to then be able to begin their review. A. Navigate to the Account tab. B. Choose “Manage Review Sets”. C. Click on the Review Set you wish to activate. D. Click on the “Start Review” button.